ABC News estimates the president has taken nearly 300 questions in past 10 days. Forget all that "the enemy of the people" talk, Donald Trump has been spending a remarkable amount of time with reporters lately. In fact, ABC News can find no comparable time period when a president of the United States has taken more questions from the news media than Donald Trump has over the past 11 days. "He has no fear of talking to the media," a senior administration official, who asked to be quoted anonymously, told ABC News. "He relishes it and he has instructed his staff he wants to do it more." 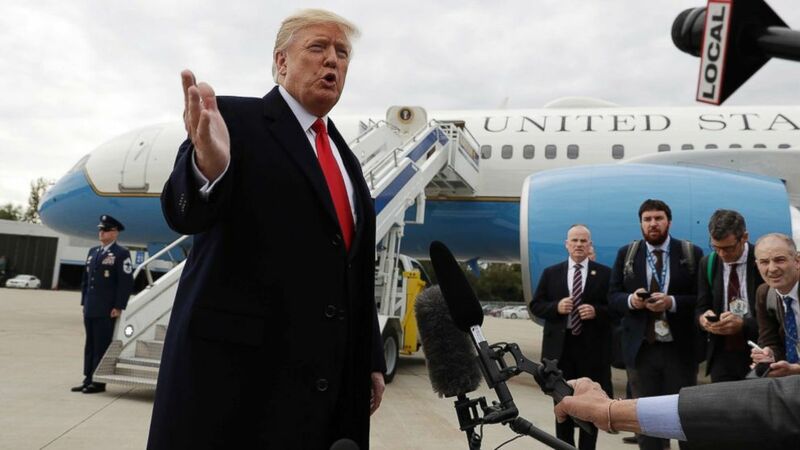 (Evan Vucci/AP) President Donald Trump delivers a statement on Pastor Andrew Brunson after landing at Cincinnati Municipal Lunken Airport, Oct. 12, 2018, in Cincinnati, Ohio. Since Oct. 6, the president has done (at least) five interviews with print publications and eight television interviews. During the same time period, he has held six impromptu press conferences with the White House press on the South Lawn and at least 18 separate White House events (alas only one with Kanye West), the president has taken questions from White House reporters. ABC News estimates the president has taken nearly 300 questions from reporters in the past 11-day span alone. In one recent interview, the president said this blitz is really all about the midterm elections. One White House official said the press shouldn't expect the president to keep up this pace after the elections. Some of these media engagements have been extensive – including a 43-minute interview with Fox & Friends and a sit-down interview with 60 minutes. At an impromptu interview with Olivia Nuzzi of New York Magazine, the president also brought in chief of staff, the vice president and the secretary of state. When the president invited reporters into the Oval Office for the announcement of Nikki Haley's coming departure as U.S. ambassador to the United Nations, he took 18 questions on wide range of questions from North Korea to Jamal Khashoggi to Hillary Clinton's comments on Justice Kavanaugh. 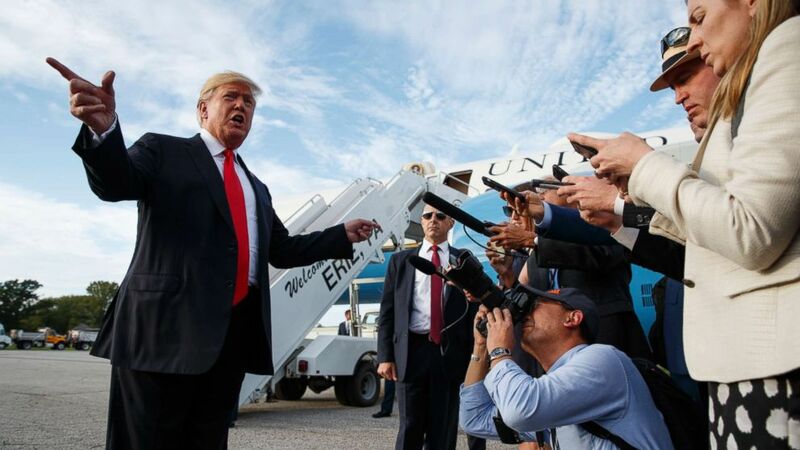 (Evan Vucci/AP) President Donald Trump talks with reporters after arriving at Erie International Airport for a campaign rally at Erie Insurance Arena, Oct. 10, 2018, in Erie, Pa.
After he answered the 18th question, the president looked at the assembled press and asked, "Any other questions?" There were none. John Roberts of Fox News later explained he had more questions, but needed to get outside for a live shot. The president has been so accessible to the news media lately that reporters haven’t complained much that the White House press briefing seems on the verge of going extinct (White House press secretary Sarah Sanders has only briefed twice since Labor Day). Rutgers History and Media Professor David Greenberg told ABC News that while the president may seem more eager than ever to take on the role as his administration’s key messenger, it risks leaving a void in what he considers one of the two main functions of any transparent White House press shop. "One is to put out the administration’s line. The daily briefings have become a mainstay in performing this function. The other key role is to field queries from the White House press corps, which is enormous,” Greenberg said. “If Trump is, for now, taking over the former role, the press office still has the second role to perform, which is arguably more important." 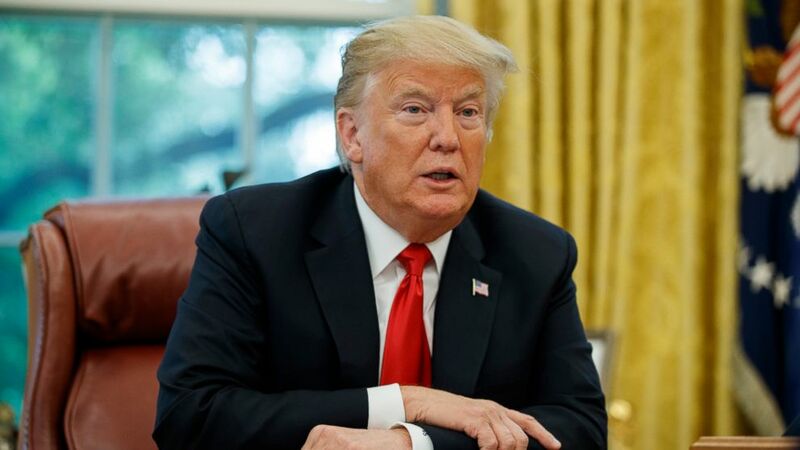 (Evan Vucci/AP Photo) President Donald Trump speaks during an interview with The Associated Press in the Oval Office of the White House, Oct. 16, 2018, in Washington. "You guys don’t want to hear from us, you want to hear from him," explained the White House official who asked to remain anonymous. To many reporters, the disappearing press briefing remains a concern, but, the official has a point: Sanders’ boss has been taking so many questions from reporters, it's not clear there's much left for her to say. ABC's Alexander Mallin and Max Hamid contributed reporting to this article.